1972 My friend Glen Morgan and I bought each other $167 Nagoya guitars at Veneman Music in Greenbelt Maryland for our 18th birthdays, that were 1 day apart, and still are. I traded my guitar for my autoharp in 1975, and Glen still has his. I played it last year, and it is a pretty good guitar. One of the first Japanese Martin imitations. At the time I also had my first guitar, a Hoyer 12-string I bought with my summer work money after graduating from high school the year before. 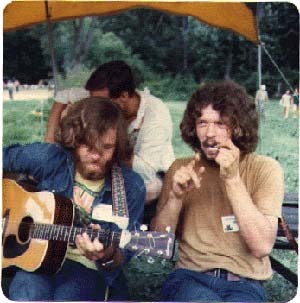 Spent the summer going to bluegrass festivals with my friend Steve Weih (pictured at right), looking like total lowlifes, selling jew's harps and picking all the time. 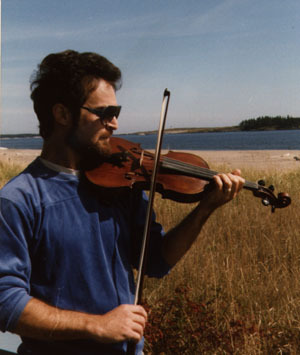 Then I quit school at University of Wisconsin in my first semester, began playing in a square dance band and at coffeehouses, at a time where I was very much more iterested in studying music than abstract mathematics. Hitchhiked to Tennessee on Thanksgiving break, and ordered my 1st good guitar- a mahogany Gallagher that I still play. In the photo here I am playing the Nagoya in Wisconsin, right around the time I quit school. You can even see the frost on the panes in this WEB photo. This was me foolishly embarking on a life of music. If I knew then what I know now!!! I played street music in Boulder, Chicago, Boston, DC, New Orleans, etc., played open mikes, coffeehouses, anywhere. Used to do things like street fiddling and barging into a bar with a banjo and pass the hat. Got my Gallagher guitar in the mail in September, and played it 12 hrs a day in a Volkswagen seat on the front porch of a rental house on Pleasant St in Boulder. Here I am in 1976 playing at a bluegrass festival in Virginia with the impromptu Valley View, Hog Roast & Squirrel Gravy String Band. A hand of heaven reached down and I took a part-time folk guitar teaching job at University of Maryland. Shaved the beard, left a mustache until 1980. Played my first bar gig in D.C. Can't remember the name of the place. Meager paychecks (last ones I ever had) enabled me to buy my first vehicle, at age 22, a 1968 VW Microbus, and I took out a loan to buy a PA system at Chuck Levin's Washington Music Center. I still use one of the Shure SM-57 mikes I bought then, sort of for good luck. (Maybe it has been bad luck and I did not know it!) Began work on folk guitar textbook. Began research on partial capo. Chopped up an elastic capo to make an A chord. 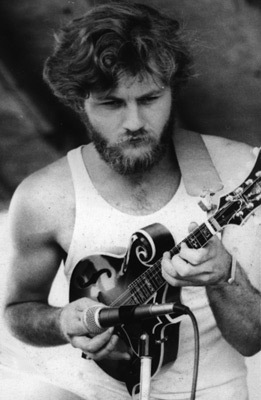 Won the flatpicking competition at Bill Monroe's Beanblossom Bluegrass Festival, and after 14 days at Beanblossom, seeing Kenny Baker, the greatest fiddler in Bluegrass music, knocking on tents taking tickets and the Bluegrass Boys cleaning outhouses at 6AM, I somehow lost interest in playing Bluegrass music. I still love it, I just lost interest in pretending that I am a hillbilly. 1977 Taught guitar. Toured New England in the summer with the Harvey Reid Band: Lynn Rothermich (vocals), Ed Kumpf (bass), Paul Senn (guitar + mandolin)Summer 1977 (age 23) Picture 2= Harv and Lynn on Jan and Grahm Walker's porch, Arlington, MA. Picture 3= Harv + Lynn in College Park MD, Picture 4 = Harv, Loring Safford (fiddle) and Bryan Quigley (mandolin) at the Varsity Grill playing for beer. Taught guitar and played gigs in Summers and in-between with Ed Kumpf. We Were known at The Warmwater Brothers (Luke and I.P.) 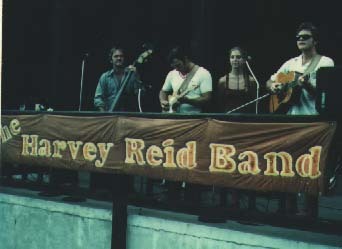 Here is us at the Bangor State Fair in the summer of '78, with me uncharacteristically playing 5-string banjo. I never owned a 5-string until the 1990's, and this one belonged to Ed. Started writing songs for the first time since high school. 1979 After a particularly harrowing tour of Maine and NH ski resorts over Christmas, capped with a delightful episode of kneeling in the ice near Mt Washington in sub-zero temperatures fixing my VW Bus for the 500th time, something in me snapped, and in the Spring I got my father to cosign a loan and bought a new Chevy van, quit teaching, moved into my van full-time, (after figuring out mathematically that it was not possible to pay rent + car payments on musician wages) Began playing bars 5 -6 nights a week, mostly in New England, but also in Midwest and DC area. Moved to Nashville later in the year, and I cannot remember why. Had some friends there was part of it. Lived on Music Row, shopped my songs, and tried to get studio work playing acoustic guitar, slide guitar, and mandolin. They laughed at me, though it's hard to find a Nashville song these days without one or all of those sounds. Played electric and lap steel in a punk band for fun, ate a lot of grits at Mack's Country Kitchen, and learned a lot about the Nashville experience. Haven't gone back much since. Nashville always reminded me of a sort of Wonder Bread factory, where raw, nutritious grains come in one end, and bland, predictable stuff comes out the other end. Sure heard a lot of good musicians and songwriters who came there from all over the country, only to be told that they were doing it all wrong and to stand in line to learn to do it right. It still chills me to think of all the heart-felt music that got rejected there and went back to wherever it came from, never to be heard from again. Worked for months with mentor and co-author Dr. Terry Kuhn at Kent State University, and our guitar book was signed by Knopf/Random House. They rewrote every sentence in it, and named it Modern Folk Guitar. It was the first college textbook for folk guitar ever published, and is still in print (until 2014), since sold to McGraw Hill, in their textbook division. Met fellow songwriter Jeff Hickey in Nashville, and we formed the Third Hand Capo Company. In May I left Nashville, moved back into van, played many more gigs. Was very serious in almost all pictures from this era. Published A New Frontier in Guitar, a self-published book about the Third Hand Capo. Played electric guitar and fiddle (and 1 song on banjo!) 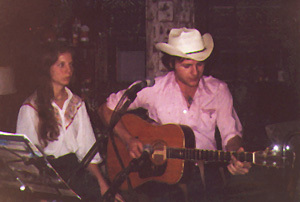 in the Rainbow Riders (in photo with Kate Toomey and John Hicks) , a Northern Virginia-based country-rock band. We even played in a place in Philadelphia with a mechanical bull. 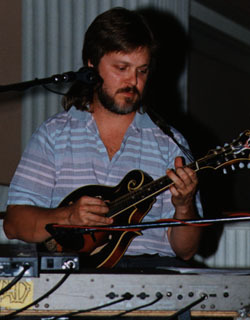 The pedal steel player in that band, Robbie Flint, now plays with Alan Jackson. Kate is married and living in Kentucky. After spending years playing street music and crummy bars and feeling like I was getting no where, I took a chance, played some extra gigs to save up the $, drove 1800 miles from New Hampshire to Winfield, Kansas in September and won the 1981 National Fingerpicking Championship. I figured it was only a matter of time till the record companies came knocking. Continued to play full-time gigs in the New England blue collar guitar circuit, averaging 5 nights a week. Record companies didn't knock even once, so I rented a studio (TRACK studios in DC) and recorded some tracks of instrumental guitar and autoharp that I sent to record companies. Months passed with only rejections, so I accepted my brother's offer to make the album ourselves and start a label. I named it Woodpecker, for no real reason except that I like the way it sounds when people from Maine say it. Checkered Records was my second choice. Spent the Spring recording, and the whole summer in Wisconsin learning what to do, pasting up art work, doing the mastering and paperwork and all that, and had the first box of them shipped to me at the end of September. First album was called Nothin' But Guitar, released in Fall 1982 as Woodpecker #101. Sold a few hundred records, gave away even more, got some rave reviews, didn't become a star, so I did the thing I thought you were supposed to do, which was make a studio album with a 4-color cover. I rounded up my favorite singers and players, and went into TRACK studios in Silver Spring, MD, where some legendary albums had been recorded, and in 56 hours we made A Very Old Song. Began paying rent full-time in Portsmouth NH, and released #102 A Very Old Song in August. With the designer look and color printing I figured all I had to do was get some airplay and I was a star. Now I had even more closets full of boxes of records, no money, many debts, and no stardom. In September, Tom Daly, the owner of FISHTRAKS Recording studio, asked if I would like to join a project he was cooking up of local artists to make a Christmas album. I worked up the 2 songs he asked for, and he engineered the recording himself. When I finished, he asked "Sounds great. Got any more of those?" and I found out that nobody else had showed up to record. 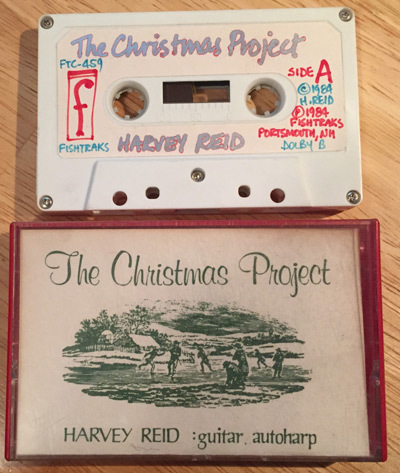 In the next 2 days we recorded about 10 cuts, many of them improvised on the spot, and a tape called The Christmas Project showed up at a few local record and book shops in the first week of December. We sold 57 of them that year. There are a couple hundred of them in the world at most, the early ones hand-written, as shown here. It launched my recording career, since people really liked it and bought lots for gifts. And it taught me something about capturing music "alive" during recording. 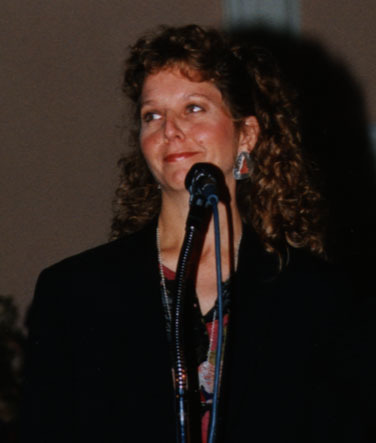 In 1984 I also first hooked up with Taylor Guitars, who at that time consisted of about 4 people: Bob Taylor, Kurt Listug, Larry Breedlove, and Tim Luranc, all of whom are still there. Here is a picture of me at the first trade show I did guitar demos for them in their booth, with one of my heros James Burton, who played with Elvis, The Everly Brothers, Ricky Nelson, EmmyLou Harris, Gram Parsons, and many many more. (Above) Harvey and guitar legend James Burton (he was Elvis' guitar player, as well as EmmyLou Harris, Ricky Nelson and many others) at Taylor Guitars booth at the NAMM (musical instrument trade) show 1985. 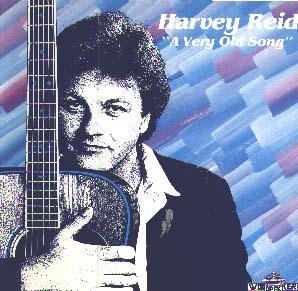 Harvey was the first guitar player to endorse Taylor Guitars and do in-store clinics for the, beginning in 1984. After 2 more years and many hundreds more crummy bar gigs and still no stardom, I got over-caffeinated and spent months logging all the gigs and radio interviews that I had on tape. In the gloom of listening to bad tapes of myself emerged something that felt like truth- I discovered that it was common for me to have dozens of supposedly identical versions of a song on tape and only like a couple of them. 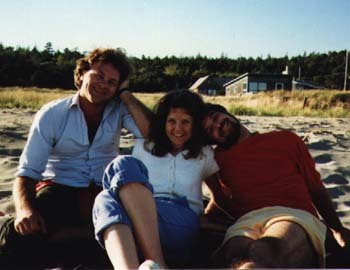 And then I spent a couple weeks in Maine at my family's cottage on the ocean with Brian Silber, my favorite music buddy. The work tapes we were planning to make suddenly started to sound really good. My former girl friend and singing partner Lynn Rothermich showed up to visit, and we filled up hours of tape on a TEAC reel-to-reel recorder. I found that I liked what we had recorded spontaneously and casually more than the things I had rehearsed and spent a lot of money to record in the studio. I concluded that music is a fragile thing- and you must be wily and patient to sneak up on it in order to record something that has some life in it. Like trying to smile when you're getting your picture taken. Recorded until Thanksgiving or so, and the result was #103 The Coming of Winter, which, because I had a song that was 23 minutes long, was issued as only an 85 minute tape. My friend Joan at the Bow Street Candle and Mug shop offered to sell them in the store, and to our surprise people bought them by the hundreds, as they did at many other local stores. I actually started to sell a measurable number of albums, and started to get the radical idea that maybe enough people liked music that wasn't edited and doctored and designed for commercial purposes. This is also when I realized that people liked longer albums. Seemed to take them 4 times as long to get sick of an album that was twice as long. I now try to make 'em around 70 minutes. So I re-packaged the Christmas album, added 6 more cuts to make it longer and gave it a new name, The Heart Of The Minstrel On Christmas Day. People liked The Coming of Winter so much that I felt compelled to make a sequel, so I decided to be a pioneer and make an all-digital, live music album in the studio, without edits, overdubs or splices. Rick Watson, Susie Burke, David Surette and Sarah Bauhan helped out. 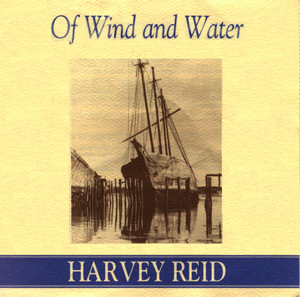 The result was #104 Of Wind & Water, recorded at FISHTRAKS in Portsmouth, NH, released as a tape and CD in November. It also was very well received. This is when I started to get the picture that maybe I should just keep recording real music and forget all about trying to have hits and a modern sound, play the radio promotion games and all that Hollywood stuff. I liked the idea of having a CD, and got many requests for CD's of my earlier albums. So in my hard-headed way, I decided that rather than just re-issue #101 Nothin' But Guitar on CD I would re-record the ones I thought I could play better now. So off I went to The Cottage in Maine, this time with a portable digital recorder that weighed 4 pounds! And #105 Solo Guitar Sketchbook was born, once again with no edits or splices or overdubs, with 9 re-recordings and 10 new cuts. Having no idea I was doing anything but being thrifty or sensible, I put it out into the void once again. This time the reviews were amazing, and suddenly it was news in the guitar world that a musician had actually plugged a mike into a tape deck and played real songs instead of piecing it all together in the studio. The mastering engineer said it was the first time in 1000 CD's he had ever done one with no edits, and he even wanted to buy some for his friends. I wrote a lot of articles that year for magazines on how to record your own CD's. The photo above ran in Guitar Player Magazine with a full-page story.